On request customizable logo and screen printing on the carrying case. The separation of twinned hoses using the Splitting Tool becomes a simple and reliable procedure in order to get quickly and in total safety two separate single hoses, ready for fittings. 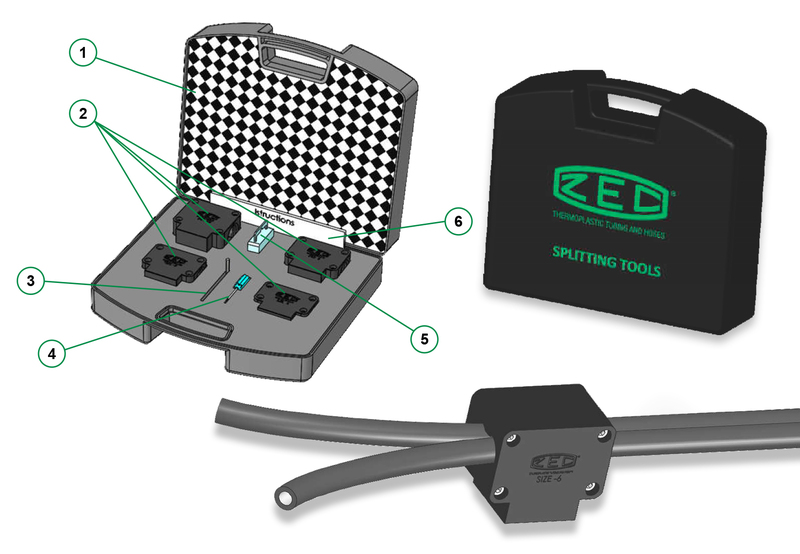 Thanks to the double-edged blade put inside the Splitting Tool, the hose is perfectly guided into the separation, minimizing the risk of damaging the hose cover, as often happens using other tools available on the market. The blade is also protected from accidental bumps and falls and it prevents possible involuntary injuries of the operator. Always use original ZEC products to ensure maximum safety and reliability. Two spare blades are included. You can purchase additional original spare blades by contacting ZEC S.p.A. sales department. LMP1 blades have two sharp edges and can cause severe injuries. Pay close attention to handling them.